"With out a doubt a superb agent to have on your side. Eric VanDyke is a consummate professional who has such a great insight with the area market. He will not pressure you like a used car sales person, and helped us in ways that go above and beyond what I would expect from a realtor. Every person that I spoke with who has also dealt with Eric had nothing but glowing praise for him. He truly cares about his clients and maintains a very high standard of ethics. You will not regret having him as your representative!" Whether you are selling a single family home, condo, waterfront, or investment property, the Van Dyke Team has the expertise and resources to serve your particular needs with double coverage. 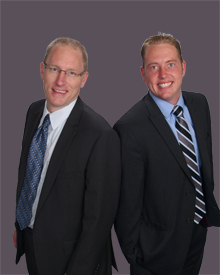 Eric and Joel work together with their dedicated team of the best real estate professionals including; lenders, title agents, inspectors, building contractors, handymen, cleaners, stagers, and more. These key relationships ensure you get the best service that you need with your purchase or sale. With hundreds of highly satisfied clients the VAN DYKE TEAM is your best choice. Quisque non bibendum lacus, ac viverra neque. Fusce at neque bibendum, malesuada tellus quis, hendrerit erat. Ac viverra neque fusce at neque.